Our German food is generally not known to be particularly refined (which is not necessarily true by the way) but there definitely is a wide variety of it and regional specialties without end. And what’s more: plenty of those specialties have a history. One especially tasty Swabian delicacy is Maultaschen. 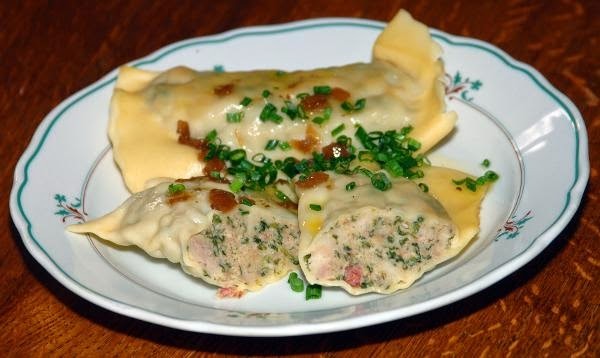 Maultaschen are kind of similar to an Italian ravioli just bigger, with a filling of spinach and meat. Where the current name comes from is unclear but formerly it was also called ‚Herrgottsbscheisserle’ which would translate to ‚little God cheating things’. And this aptly describes how the Maultasche (supposedly) was invented. During lent monks weren’t allowed to eat meat but they still wanted to so they came up with all kinds of creative strategies like chasing pigs into water and then declaring them fish or the like. The Maultasche was also a cheat. The meat was chopped really fine and then mixed with the spinach to color the whole thing green. In the end that paste was wrapped into noodle dough. Like this, so thought the monks, God wouldn’t see that they were actually eating meat as it was now green and hidden under a thick noodle cover. Lent is actually still adhered to my many people in Germany but trying to cover up meat consumption is not en vogue anymore at all. Still the Maultasche has survived and is an extremely popular dish that can be found on almost any restaurant menu in the South-West part of Germany. For those on a low budget there is a wide variety of the ready made kind available in supermarkets. They can be eaten boiled in broth, braised or fried. Our favorite version is the braised or fried one with caramelized onions. Fret not if you are a vegetarian: With modern times comes modern style and vegetarian (all spinach or vegetable) Maultaschen are available too.